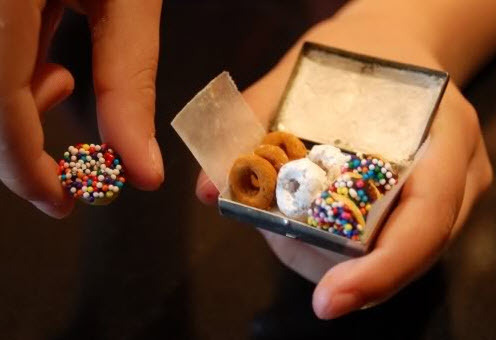 Turn Cheerios into tiny donuts for your rat! To make chocolate frosted donuts, melt a piece of chocolate in a bowl. Dip one side of a Cheerio into the chocolate, then press the chocolate side of the Cheerio into a pile of sprinkles. To make powdered sugar or cinnamon donuts, put your fingers in some water to moisten them, rub the moisture onto the Cheerios, then roll them around in the sugar or cinnamon. Put the donuts in a small mint tin with a piece of wax paper to look like a box of donuts.